Cat Ba Express is a nationwide leading Bus & Tours company providing quality transportation and personal service for Hanoi – Cat Ba, Cat Ba - Hanoi excursion including tours: Unique Lan Ha - Ha Long Bay Day Trip or Over night Cruise name: Ha Long Serenity Cruise, special events and more. No matter when you want to go for an adventure and explore new things to refresh yourself, our company is always able to offer safe, reliable transportation, tour services with unbeatable value and exceptional service. 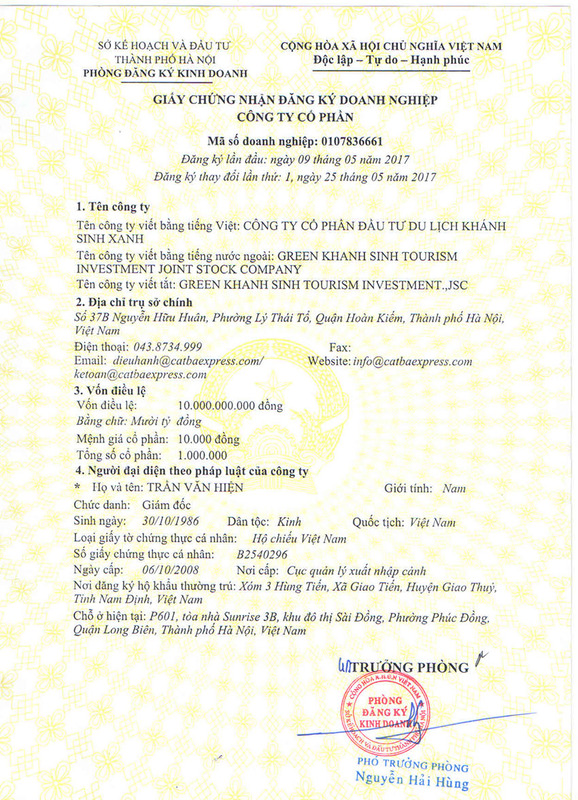 Cat Ba Express - License. Why should you choose Cat Ba Express? Cat Ba Express is one of the fastest transportation for tourist to travel from Hanoi to Cat Ba. With our excellent service, you can enjoy the breath-taking natural landscape of the island just at the drop of a hat. Cat Ba Express offer both round trip and one way transportation for a wide range of needs. The full service encompasses picking-up at clients’ hotels in the morning, a short commute to the destination and drop-off at hotels in Hanoi when the journey completes. Our experienced staff will support you from the first call to the last mile so that your trip will be executed flawlessly beyond your expectation. We pride ourselves on not only safety and first-rate customer service as our top priorities but also punctuality and timely transportation with just 3 straight hours and a half on bus which is 2 hours earlier in comparison with normal buses thank to the high quality Samco Felix Limousine buses. - Wi-Fi, power outlet, free water and wet tissues, etc. Private transfer by speed boat Dinh Vu - Cat Ba. Free picking-up at clients’ hotels in the morning, a short commute to the destination and drop-off at hotels in Hanoi when the journey completes. We believe there is no substitute for our bespoke service. With the best of everything, full service, we aim to bring you the extraordinary experience. The service Cat Ba Express offers is second to none. We aim to always exceed the expectations of our clients, staff and suppliers.